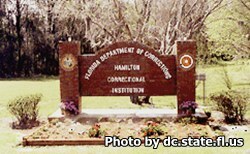 Hamilton Correctional Institution is located in Jasper Florida. It is a level IV facility that houses minimum, medium and closed custody inmates. Currently this facility can hold approximately 1,180 adult male inmates. Educational programs at this facility include adult basic education classes, and GED courses which allow inmates to earn a diploma equivalent to graduating from high school. Vocational skills that are taught at this facility include electrical systems, masonry, and cabinetmaking. Religious and worship services are held through the prisons chaplaincy service. Currently this facility offers no substance abuse treatment programs. Prior to your visit, you must have filled out a visitors application and it must be approved. Approval can take up to thirty days after you submit your application. Visiting is on Saturdays and Sundays from 9am-3pm. Visitors may arrive at the institutions parking lot no earlier than 7:30 am. Registration for visitation begins at 8:15am, and ends at 2pm. If you arrive after 2pm you will not be allowed to enter into visitation.